Humanoids, publisher of the international bestselling Incal series, and renowned poster designer Mondo announce new Moebius inspired print available at San Diego Comic Con. 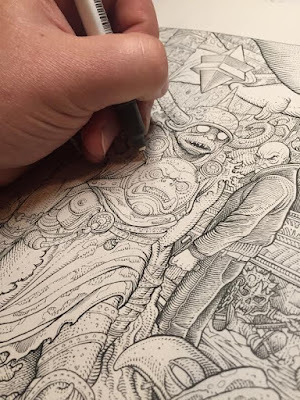 Los Angeles, CA – As part of their Moebius May celebrations, Humanoids reveals work-in-progress artwork from an upcoming Moebius-inspired print based on the worldwide bestselling graphic novel The Incal, created by Alexandro Jodorowsky and Moebius. The print will be available from Mondo at this year’s San Diego Comic Con, July 21-24, 2016. Jean Giraud aka Moebius was born on May 8, 1938 and was one of the co-founders of Humanoids (Les Humanoïdes Associés). The multiple Eisner and Harvey award winner has been cited as an influence by filmmakers such as Ridley Scott and Hayao Miyazaki, as well as by artists the world over. The concept artist behind ground-breaking films like Alien, TRON and The Abyss, as well as a concept designer on The Fifth Element, is even more acknowledged for his works in comics and graphic novels, including: Arzach, The Eyes of the Cat, and the The Incal, among many others. 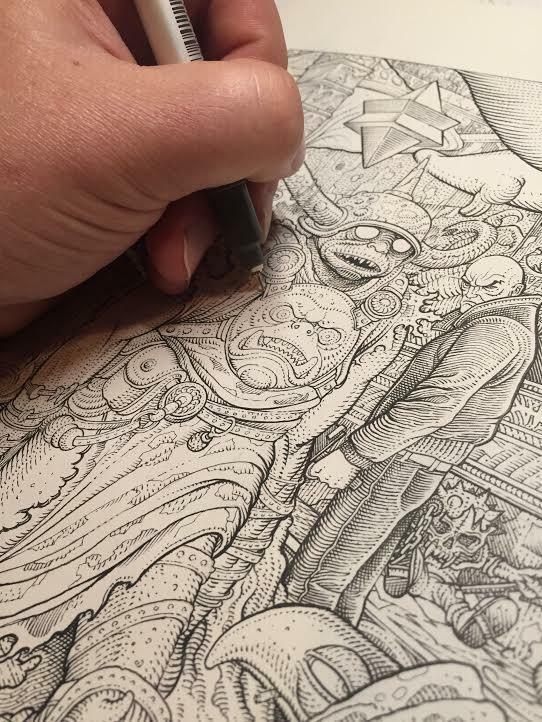 "I remember there were a few things that ran through my mind when asked to do a print based on The Incal. For one, I was obviously excited, and I have to admit felt honored to be asked to do it. Keep in mind we are talking about a comic book that was not only drawn by the godlike Jean Giraud, but also written by the one and only Alexandro Jodorowsky himself. It's kinda the comic book equivalent of the Ark of Covenant. The other things going through my mind? Pure horror and dread. After many sleepless nights and mediocre sketches, I decided to not base my art on events from the book at all, but on what follows after John [Difool] saves the universe and gets reborn. Even though he is the savior, he is still the fool from the beginning, and his karma dooms him to be reborn and relive everything. We see him sitting confused and alone with all these key figures from his past life walking past him. Nobody recognizes him and vice versa.. The only memory he has are the creator's last words: 'Remember!'" HUMANOIDS released its first graphic novels 40 years ago in Paris, France, and has published thousands of titles since, including international bestsellers and iconic series such as The Incal and Barbarella. Based in Hollywood, California, with branches in Paris, London, and Tokyo, Humanoids is currently developing multiple film adaptations of its books, including Bouncer, Metal, I Am Legion, and The Z Word (aka The Zombies That Ate The World). company has received global recognition for bringing art back to movie poster design and has emerged as one of the leading curators of classic and contemporary film soundtracks on vinyl. Utilizing the talents of world class artists and designers, Mondo produces limited edition, screen printed posters based on film, television and comic properties, working with the leading entertainment brands including DC Comics, HBO, Marvel, Paramount Pictures, Universal Studios, Walt Disney Studios and Warner Brothers as well as filmmakers like Paul Thomas Anderson, Guillermo Del Toro, Zack Snyder, Quentin Tarantino and Edgar Wright. Based in Austin, TX, Mondo operates out of a permanent gallery space, hosting regular exhibitions featuring a blend of breathtaking original artwork and limited edition screen prints. Mondo aspires to be a creative home for artists and designers to work and have their visions realized, whether through posters, gallery shows, vinyl, apparel or toys. Their first convention in 2014, MondoCon, was a celebration of art, music, film and their creators. Mondo is also recognized by the Academy of Motion Picture Arts & Sciences with a full archive of film posters as part of their research library. The parent company of Mondo is Alamo Drafthouse.